Pedigree to see off the competition. Class and Quality of the Milltek Sport Brand. Milltek Sport exhausts are produced in high quality type 304 aircraft grade stainless steel. This material is anti-magnetic (other manufacturers stainless steel may not be) and is less susceptible to discolouration. The NEW ST 225 exhaust is the quality system the car deserves. It fits to all std ford joints and can be interchanged with any manufactures system. The full 70mm bore allows for power outputs of over 400bhp on turbo applications whilst keeping noise levels down. How loud is this System ? The Pumaspeed Workshop team are ready to fit the EC-Approved Milltek Sport - Focus ST225 Cat Back Exhaust (Resonated) with TUV in our Head Office located here. We estimate the labour time to be approximately 0.90 hour(s) costing £70.20 inc VAT. Therefore making parts and labour a total cost £662.12 (inc. VAT). 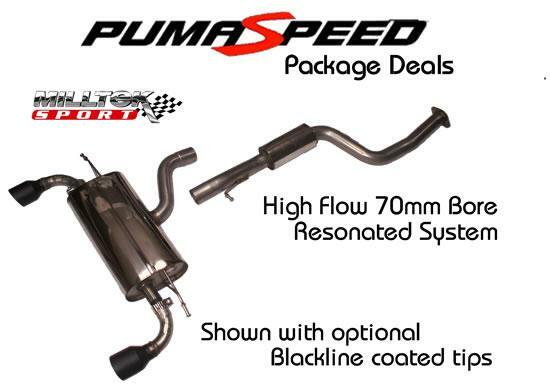 Pumaspeed have a specialist distribution team that can dispatch the EC-Approved Milltek Sport - Focus ST225 Cat Back Exhaust (Resonated) with TUV to any destination worldwide.